A number of appointments can now be booked on line using PATIENT ACCESS. To register - please click on the link above. From 1.12.17 all GP appointments will be bookable on line - sign up now. If you feel you need to be seen on the same day with a medically urgent problem, please call our appointments lines as above. The doctors offer a number of "sit and wait" appointments at the end of their surgeries for on-the-day urgent problems. These are offered in addition to their routine appointments and they ask for your patience if they are running a bit behind by the time they are able to see you. The doctors ask patients to give the receptionist a brief discription of their symptoms for urgent problems. This ensures you are given an appointment with the correct clinician. We now have a Minor Illness Nurse (Laura Roffey) who can deal with many urgent problems. Patients may be offered an appointment with if she can deal with their problem. This frees up the doctors to deal with more complex issues. The quickest and easiest way is to go online - see blue "Quick link" on webpage for details. Alternatively please phone on the numbers above. Patients are encouraged to see their own (registered) GP whenever possible. Appointments are at 10 minute intervals and can be booked up to one month in advance. If you have multiple problems to discuss, please consider booking a double appointment (20 mins). If this is not done, the GP may deal with the most important problem during the appointment. We offer regular early morning (7-8am Wednesdays) and late evening appointments (630-830pm on certain Tuesdays and Wednesdays) with GPs and Nurses. Please ask at reception for details. In addition to our commuter surgeries, we work with local practices to provide you with access to medical services for routine problems outside of normal working hours (between 630 and 8pm on weekdays, and at weekends). These appointments are based at a central “Hub” practice (which often is not The Village Surgery). 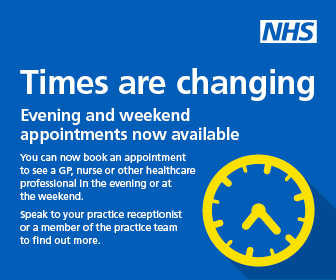 If you are happy to be seen by another practice's doctor, and for them to have access to your notes to deal with a routine problem, please ask reception about these appointments. If you cannot attend an appointment for any reason please inform us as soon as possible in order for us to give the slot to someone else. Patients can use the automated telephone and online systems to cancel appointments.